Repurposing derelict tombstones of the Industrial Age — Brightleaf Square and American Tobacco Campus in Durham, High Point’s Market Square and multiple factory buildings in Winston-Salem’s Wake Forest Innovation Quarter — have resuscitated entire communities, infusing a permanent sense of vibrancy and viability into what were forlorn economic and cultural dead zones. 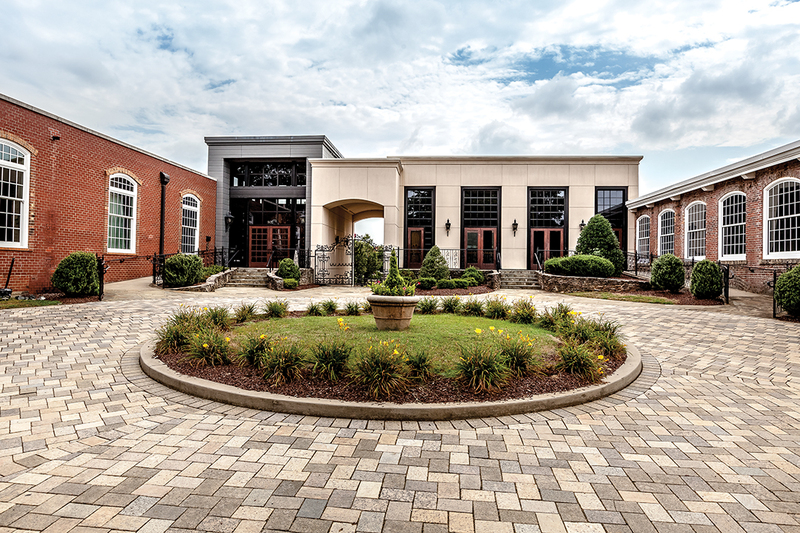 With the aggressively forward-thinking adaptive reuse of Cone’s former Revolution Mill, Greensboro can finally lay claim to our own cutting-edge venue sculpted from a historic property, a multi-modal monument as impressive as the metropolitan jewels other Carolinians have been bragging about for years. Abandoned manufacturing hubs have been reacclimated here before. Cotton Mill Square was a magnificently funky shopping mall carved out of an 1895 textile works that also served as Western Electric’s top-secret electronics headquarters. It was regrettably demolished in 2008 but Wafco’s one-time flour mill (condominiums since the 1980s) is a lynchpin of the College Hill neighborhood. The urban reinvigoration underway now is on a scale we’ve not witnessed, and it’s as essential to the future of this city as the industries they supplanted were to our past. No question, the Cone family put Greensboro on the map beginning in 1895. Recognizing an emerging market for durable work clothes, they ramped up quickly with four enormous manufacturing plants: Proximity, Revolution, White Oak and Proximity Print Works. Built in 1898, Revolution Mill became the largest producer of flannel in the world. By the 1920s, one in seven Gate City residents worked for Cone, with more than 200,000 yards of denim leaving the weave sheds every day. at several company-owned grocers, sent their kids to Cone schools and to Camp Herman in the summer and gathered at annual picnics. Teams from each plant competed against each other on four adjacent baseball diamonds. There was a hotel, coffee shop, fine dining restaurant and two YMCAs with bowling alleys and fully equipped gymnasiums with year-round swimming. A worker could easily spend weeks without leaving the Cone confines where every aspect of life was represented, or replicated you might say, right down to the mill barbershop, drugstore and doctor’s office with nurses who looked in on expectant mothers. A single sheriff’s deputy kept the peace in this city within a city. Not that it was an idyllic utopia. It wasn’t, but that’s another story. Cone continued to manufacture denim in Greensboro until it was blended into Internation Textile Group (ITG) in 2004. ITG still produces denim at its White Oak plant. In the 1960s, however, Revolution Mill occasioned one of the biggest fashion fads ever in jean manufacturing — but not by design. Old-timers still gab about that Sunday afternoon flood in June of ’68. Although a tremendous amount of rainwater fell in a short period that day, the mill’s runoff system was able to handle the capacity. That is until an empty 500-gallon tank came unmoored from its scaffolding, slid into the rushing creek, then jammed like a cork into the outflow under Summit Avenue, sending chemical wastewater surging into nearby homes and overwhelming a storage facility at Revolution. The aftermath left thousands of yards of denim hopelessly mottled and bleach-stained. Someone had the bright idea to stitch them up anyway and the acid washed jean was born. Cone unloaded Revolution Mill in the early 1980s after the bottom fell out of the textile business, locally anyway. 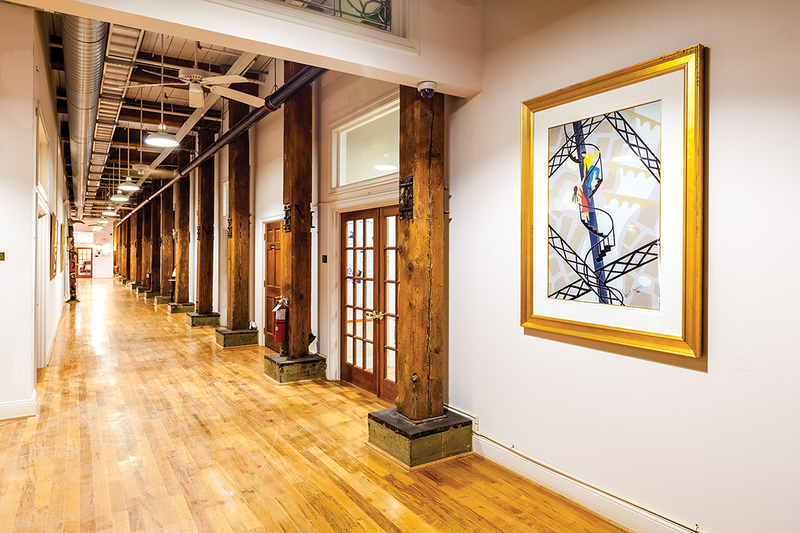 Two decades later, developers Frank Auman and Jim Peeples converted a large swath of the mill into an office and event space, the most visible occupant being The Nussbaum Center for Entrepreneurship. 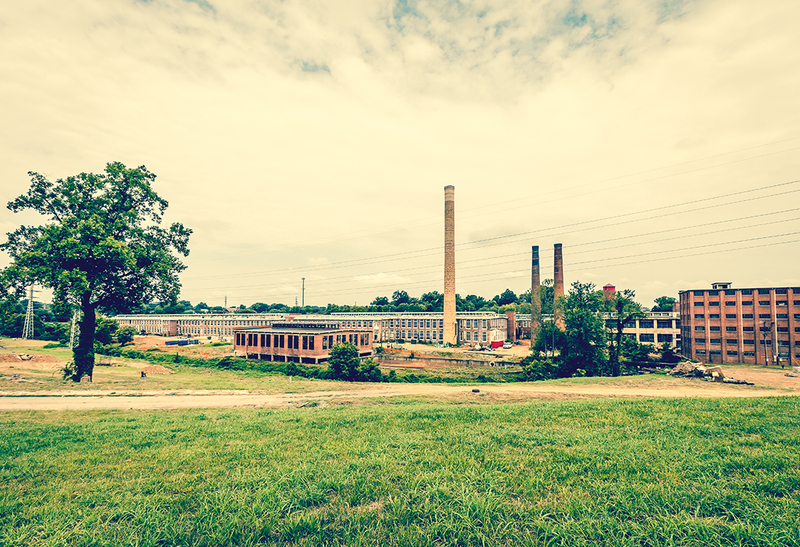 Forced into foreclosure in 2012, Revolution Mill found a savior in Self-Help Ventures Fund of Durham, which develops and invests in commercial real estate projects like this one and paid $8 million to rescue the 45-acre property. “CEO Martin Eakes is from Greensboro so it was a pretty easy decision for him that we would complete this development rather than try to develop it with somebody else,” says Self-Help’s Development Manager Micah Kordsmeier. The organization then proceeded to plow an additional $100 million to forge a campus where creativity, commerce, art and contemporary living converge. It’s a miraculous makeover of colossal proportions, this Gate City phoenix. 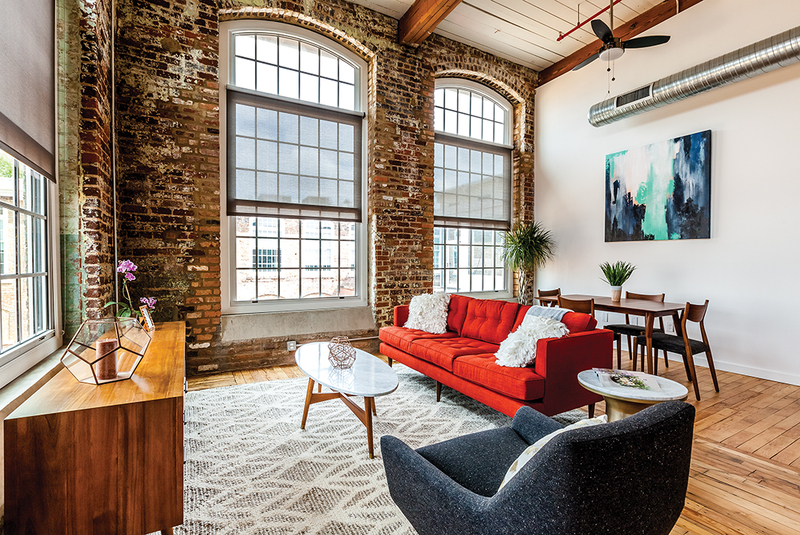 Listed on the National Register of Historic Places, Revolution Mill had to be gutted and reimagined from the ground up. The original maple flooring, sturdy brickwork, oak support beams and frames were all preserved and enhanced with the latest technological advances, then made to look sleek and ultramodern with interior glass walls. The result is a hive of activity with 250,000 square feet of office and studio space where the entrepreneurial spirit thrives. The variety of enterprises afoot runs the gamut — optometry, portraiture, finance, retail, advertising, dining, digital illustration, furniture design, 3D rendering, you name it. Architectural artifacts of an earlier age abound. A heavy metal fire door in one office, barn-like gates in another, not to mention the numerous weather-beaten, concrete bunker like flying buttresses that at one time secured outside walls since the vibration from the looms would have quaked the bricks from the framework without them. Attention to detail? Even sewer covers with the Cone logo were restored. 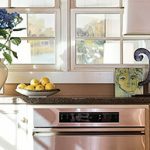 Hundreds upon hundreds of energy efficient, 8-foot tall windows needed to be manufactured, almost every one requiring slightly different specs because of the age of the building. Large segments were cut out of the upper level flooring to give the interior a feeling of grandiose openness throughout. Revolution Mill is a way of life once again. Located in the oldest portion of the building are 142 one- and two-bedroom loft apartments with rustic touches throughout. Original artifacts are incorporated everywhere, 26 separate floor plans all reflect an unmistakable solidity. Look for the dull, comforting thud of hardwood floors, hallways of polished concrete with exposed wooden structural beams, Manhattan-sized windows tucked into 100-year-old, thickly mortared brick walls stretching 20 feet upward. The building’s solidity makes for a spectacular setting, whatever one’s taste in home furnishings or entertainment style. Perfect for hobnobby cocktail parties or literary receptions, but equally well-suited as a crash pad for your old college buddy’s punk band. In another wing, an artist colony with a dozen studios for working painters, designers and sculptors is flourishing alongside UNCG’s Weatherspoon’s spacious outlier gallery hosting bimonthly installations. The Artist In Residency Revolution (AirRev) program offers politically and socially conscious artists the opportunity to do their thing in a 1,774-square foot shared studio space at greatly reduced rates. There’s plenty of opportunity for cross-pollination between the two districts. An indispensable catalyst in the downtown music and art scene, Urban Grinders, is extending it’s robust blend of caffeine culture into what owner Jeff Beck is calling a more “refined coffee shop experience.” Fronted by an inviting courtyard and topped with a hardwood slanted ceiling and exposed steel supports, the satellite cafe is situated inside a cozy corner of Revolution Mill. Located in the former machine shop, Cugino Forno’s Italian wood-fired pizzas are flash-baked in a 900-degree oven that boasts “volcanic rock bottoms from Mount Vesuvius.” Their savory Neapolitan pies are sourced strictly from Old World ingredients, right down to the imported flour. The handmade Mozzarella is flown in weekly from a small town in Campania. An expansive dining area is kept impressively sunny thanks to two facing walls with rows of towering cathedral-like windows. Opening later this month, Natty Greene’s Kitchen + Market will specialize in locally sourced foods with meats cut to order, fresh baked goods and, of course, beer. This emporium can be found in the one-time carpentry shop where a striking boathouse-style canopy of shellacked maple planks, embedded with glass panes encircling its center, bathes the room in natural light. This standalone building has been augmented with a mezzanine and a super-sized party deck over the reservoir next to a rivulet where the water runs so clear you can watch tadpoles and sunfish fantailing their way east. Once considered the rear of the property, an entranceway is being fashioned off Yanceyville Street to make the brawny eastern facing buildings the first thing visitors will see. Other than the three mammoth smokestacks that is, remarkable when you consider they’ve held their ground for well over a century. That Greensboro could support such a cosmopolitan concept is an amazing leap of faith. With construction on the $100 million campus nearing completion, Micah Kordsmeier recognizes, “These industrial reuse projects have been going on for 30 years at this point.” In that time, trial and error — how to adapt the spaces for commercial use as opposed to living spaces, for example — bore out. “There’s been a lot of proving of concepts over that time so they were started in stronger markets because there was the ability to take more risk. 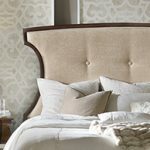 It took a long time for investors and lenders to develop a comfort and understanding of it,” Kordsmeier says. Thanks to the previous owners, the property was in much better shape than would normally have been the case with these types of reconstructions. The surrounding landscape came adorned with lush greenery and mature trees where slate steps and stacked stone garden walls neatly frame some 1,200 parking spaces. Warehouses with no historical value have been removed, and gently sloping green hills with new shrubs and saplings have replaced the muddy rivulets and thickets that once populated this panorama. It’s here that the Greenway will one day connect Revolution to downtown 2 miles away, a 15-minute bike ride. Vestiges of a long-gone way of life can be faintly detected in the patches of woods still remaining in the neighborhood. I’ve uncovered steps to homes that no longer exist and almost-buried rail spurs. Legend has it the remains are out there somewhere of an outdoor pool that was destroyed in the 1940s, when the old patriarchal system began to slowly unravel. By the 1960s, the company houses had been sold off to the employees that lived in them at bargain prices, greatly enhancing our city’s middle class. Proximity Mill was lost to the bulldozer in 1979. White Oak is still producing denim, albeit on a smaller scale, while the greatly deteriorated Proximity Print Works was recently purchased, slated to be renovated into affordable housing that will anchor a mill village of sorts for future generations. Billy Ingram was born and raised in Greensboro but hightailed it out of here as soon as he could, only to return 15 years later so he could torture you with his indigestible word salads. He is the producer of a local music TV series, The Nathan Stringer Summer Music Show, available this month on DVD at Amazon and streaming on YouTube.